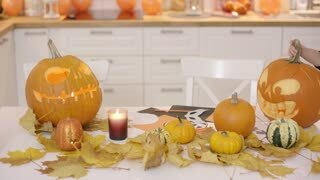 Cute little girl in Halloween costume standing near table and trying to puff out candle in scary jack-o-lantern. Cute little girl in Halloween costume sitting at table and painting paper jack-o-lantern with orange paint. Smiling little girl in cute Halloween costume standing in front white table with jack-o-lanterns and holding two small pumpkins. 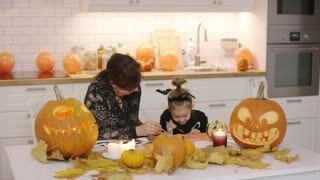 Woman and her cute little daughter in Halloween costume sitting at table near jack-o-lanterns and leaves and painting Halloween decorations. 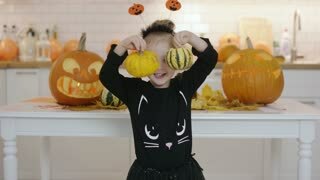 Cute little girl in Halloween costume opening spooky jack-o-lantern standing on table near small pumpkins and fallen leaves. 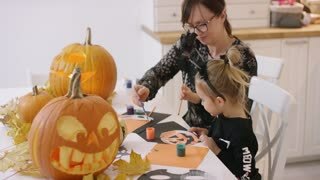 Woman in glasses and her daughter in Halloween costume sitting at table and painting jack-o-lantern made from paper.